A great happy hour spot with a lot of space, a really big bar (always warms your heart) pool tables and tons of specials. Lots of music and good energy. Valley Forge National Historical Park commemorates more than the collective sacrifices and dedication of the Revolutionary War generation, it pays homage to the ability of everyday Americans to pull together and overcome adversity during extraordinary times. The Cheesecake Factory is a unique, upscale casual dining restaurant offering more than 200 menu selections including Appetizers, Pizza, Pasta, Seafood, Steaks, Salads, Sandwiches and more. Our menu also features specialty dishes like Chicken Madeira, Miso Salmon, Cajun Jambalaya Pasta and The Factory Burger. Burgers, beer and sports on big screen TVs are our specialties at Champps. Enjoy salads, burgers, pastas and desserts that may be worth the trip all by themselves. After looking at our menu you'll see why Champps is not your typical sports bar. Maggiano's Little Italy is located adjacent to the King of Prussia Mall! Our bustling 300 seat restaurant includes a comfortable bar area, mezzanine dining, a spacious wrap-around outdoor porch and the area's largest banquet facilities capable of accommodating over 200 guests. Experience includes aged beef, award winning wine, and private dining. Seasons 52, a fresh grill and wine bar, invites you to discover the flavor of our seasonally changing menu. Seasons 52 currently has twenty-one restaurants in Florida, Georgia, New Jersey, Pennsylvania and Illinois with additional locations opening in Costa Mesa, CA (August), Plano, TX (November) and Coral Gables, FL (February). Site offers info on menu, wine list, online reservations, group and event dining, gift card purchases and location specific information. Creed's Seafood & Steaks is located on North Gulph Road in King of Prussia, PA. An independently owned restaurant featuring a comfortable, warm atmosphere and excellent service. Located at The Court in the King of Prussia Mall, guests enjoy only the finest in fresh seafood. 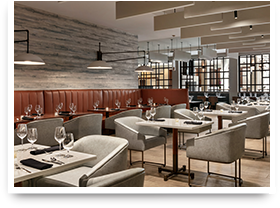 Come in and dine at Legal Seafoods and take full advantage of our ultrachic, plush dining room and extra-spacious bar and lounge. Joe's Crab Shack is an American chain of beach-themed seafood casual dining restaurant.